Onesoftperday Ads is yet another adware application that uses dubious marketing strategies to lure users into installing it onto their operating systems. If you visit the official website of Onesoftperday Ads, you will see statements that promise you one free application per day. It might seem very tempting but in reality your web browsing experience will be disrupted if you install Onesoftperday Ads on your computer. It is paramount to realize that adware applications could be quite detrimental because often other internet-based infections use adware programs as a gateway to get onto your PC. The removal of Onesoftperday Ads is necessary if you wish to maintain a clean and secure system. Removal processes could be quite tricky without proper guidance that is why a detailed guide is provided within the report. 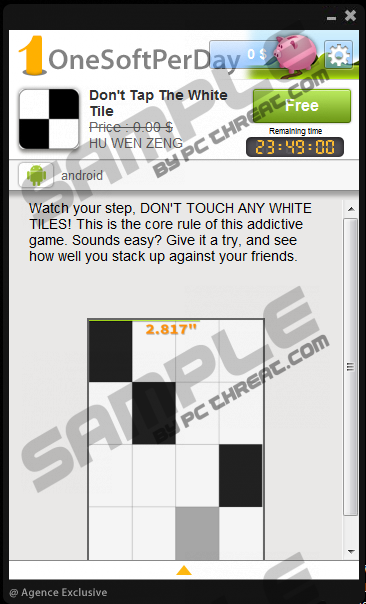 Onesoftperday Ads might seem a bit different from other adware applications. It does not install any browser extensions, but your browsers will still display worthless commercial adverts and annoying pop-ups. Onesoftperday Ads is capable of displaying adverts due to the Windows service that it creates. The service is names onesoftperday_widget.exe and is visible via Task Manager. This process can be killed but in a few minutes it will restart itself automatically; thus, the removal of Onesoftperday Ads is needed if you want to make the annoying activities stop. It is important to note that those ads are not only annoying but could be potentially malicious. It is likely that ads by Onesoftperday Ads could contain a redirect link. By clicking on such adverts, you could land on a website implemented with an arbitrary code execution exploit. That means that just by landing on such a web page you can get your operating system infected with some other unknown infection. Onesoftperday Ads provide a direct download link within the official website. Thus, it is likely that some users might be fooled by the dubious marketing strategies employed by the publishers of this nasty program. It is well-known that Onesoftperday Ads is a variation of adware known as freeSOFTtoday. Therefore, it is quite safe to assume that it is distributed in a similar ways. Bundled software is one of the main ways that a lot of dubious applications are spread (including Onesoftperday Ads and freeSOFTtoday). Beware of any suspicious download websites as they tend to provide installers filled with numerous useless applications. You are advised to implement a powerful antimalware system in order to keep your system secure. Professional antimalware tools can detect various questionable websites, dubious installers and can stop potentially malicious processes within the Windows system. Furthermore, the removal processes of any infection are conducted in a timely and efficient manner. We provide a detail manual removal guide. If you execute the removal properly and check your operating system for any leftovers (check by using the list of files, folder, and registry entries associated with Onesoftperday Ads that we provide) Onesoftperday Ads will be deleted entirely. Select Onesoftperday and click Uninstall. Quick & tested solution for Onesoftperday Ads removal.